Differentials Limit Slip, gear ratio discussions. 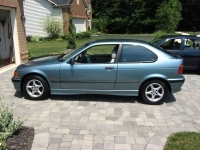 I will be tracking my 95 318ti (328ti) with M52B28 swap soon. It has a factory lsd (option). What do you guys recommend for diff oil for RACING application? I was looking at 75w90 or 75w110 Redline. Have you rebuilt the diff with new clutches? I'm not sure how the small case will hold up to the M52 on track. When I rebuilt my medium case diff the clutches were toast and that came from a E30 325i. Last I checked thayermotorsports has the small case clutches and can recommend fluids.